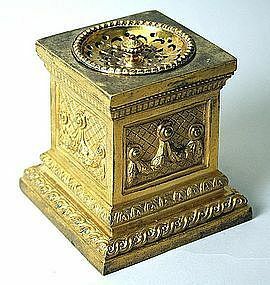 Fine Antique French Inkwell or Standish in Ormolu; having a hinged lid and circular stepped body with applied cast floral decoration, and raised on three toupie feet. Circa 1850. Antique English Ebonized Wood Inkstand, in walnut, rectangular with rounded corners, wells for pens and inks, a single shallow drawer and an ebonized carrying handle. 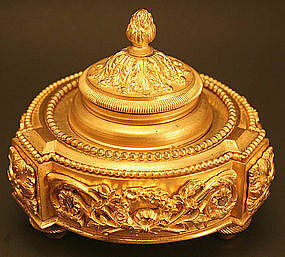 Circa 1830-40 (caps to inkwells replaced). 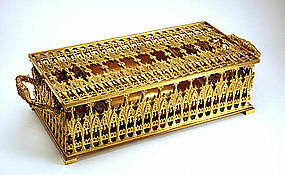 Exceptional antique French pierced and gilt metal inkstand with over-all Gothic arch decoration; the rectangular top opening to a fitted interior with two removable pen wells and four crystal inkwells (one repaired). Circa 1840-1860. Antique Bronze Pen and Pencil Holder in the form of a draw string sack. Probably French, 19th Century. Length: 4.5" Height 3.75"
Fine antique French rouge marble standish with ormolu inkwells and feet. Circa 1850-70. Fine Antique French Pedestal Form Ormolu Ink Sander, 19th C.
Fine antique French pedestal form sander in ormolu with removable reservoir for the sand used to dry the ink when writing with a quill pen. Mid-19th century.